YES, we are shaped, moved, motivated, inspired, by experiences, by people in our lives, by places, by time itself. We create perceptions, orientations and visions of ourselves and the world we share. We are ever in response to CAUSE and EFFECT. The more we become aware of the source of perception, and the impetus for each of our responses, the more we are able to develop a command of SELF. Such command implies discernment, understanding, willingness to seek cause, appreciate effect, and take full responsibility for one's actions, behavior, and projections. This is the focus inherent in the APOGEE Paradigm™. Through a process that includes an energetic evaluation, via direct body biofeedback, one is brought to understand the consciousness that defines security, flow, creativity, power, passion, balance, expression, vision and one's sense of purpose and BEING. "Within a very short time after meeting Rose Marie Raccioppi, my life changed almost instantly. Her Vibrational Sound Therapy and great wisdom that she offers helped me not only resolve the chronic pain in my jaw and face, but also helped me find new parts of myself that I had yet discovered. After my first session with Rose Marie, I was astonished by how much younger I looked; and how much better I could see. It was almost like I was reborn into a new world with a much greater sense of clarity, and freedom from all the previous tension I had been carrying in my body for so many years. As time went on after our first session, I could see the results continuing to work as the days went on. I could understand things better, hear much clearer, and found myself letting go of certain patterns in my life that were holding me back from being as happy and successful as I wished to be. I’ve been dealing with TMJ, and ear ringing (tinnitus), for almost years now, and what a relief it is after all this time to finally meet someone who has the specific skill set to provide the healing I have been in search of. Not only do I feel great physically, but also Rose Marie has given me the tools and insight that I needed to make certain changes on my own for the benefit of my life. Through this whole process, I have become much more HAPPY, HEALTHY, and MINDFUL/AWARE of who I am; and how wonderful life truly is. Ultimately, it is all thanks to Rose Marie for opening the door for me, and showing me the way into the deeper parts of myself. " 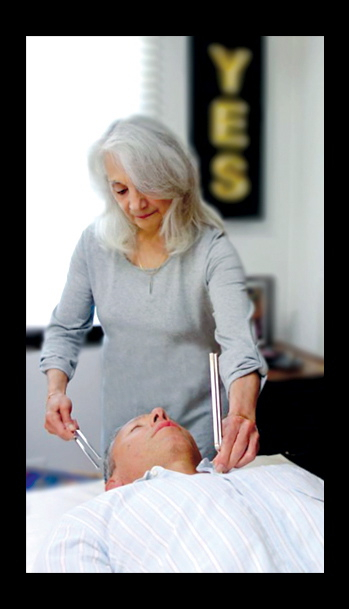 Thank you Rose Marie for the tuning fork/ sound therapy adjustment treatment today. Never ceases to amaze me how powerful your treatments are and aplicable to so many physical, emotional and mental conditions and life situations. Best of all, it's drug free and no side effects. "Just a quick note to say thank you for your help on Monday... Today, I feel very balanced and focused... Even light. My four mile run this morning turned to five effortless miles." C.M.